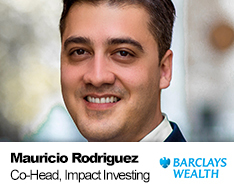 Mauricio co-heads Impact Investing at Barclays Wealth and Investment Management. He was instrumental in the development of Barclays’ Behavioral framework for Impact Investing and Philanthropy, a psychometric algorithm and profiling tool that helps clients embarking in the journey of achieving a balance between financial returns and social objectives through their Wealth. This work has been recognized in 2016 by the UK Cabinet Office’s Social Investment Awards for Market Building and by Investment Week’s Sustainable Investment Awards for Innovation. Through this new business line, Barclays will offer new possibilities to the full range of clients, including corporations, families, foundations, endowments and mainstream investors, to bring impact considerations into their portfolios and help them investing for impact across the liquidity and impact spectrum. Mauricio joined Barclays in 2010 to support the growth of the equity capital markets business at the Investment Bank. He was a key contributor in the project management, structuring and execution of multiple transactions in the UK and EU, including some high profile IPOs in the renewable energy and infrastructure sectors. Prior to this he was a relationship manager for structured products at J.P.Morgan. He started his working life as an entrepreneur, co-founding and running three businesses, the latest in the EdTech sector. Mauricio is a trustee and member of the board of Children Change Colombia, a UK based charity supporting vulnerable children in Colombia and holds a BSc (Hons) Civil Engineering from EAFIT University, a MIBA from Bournemouth University and is an alumni of the Impact Investing Programme from Said Business School at University of Oxford.